Running and Drinking Combine the Best of Both Worlds in Richmond | Food and Drink | Style Weekly - Richmond, VA local news, arts, and events. Scott Elmquist The Final Gravity Running Club meets every Thursday and combines sport with beer — some might say that’s the perfect pairing. I was skeptical when I had my first post-run beer. It was after the Dauber Dash at Henricus Historical Park in 2012. The lack of local beer further dampened my enthusiasm. But, hey, I’d paid for it, so I gave it a try. When that beer passed my lips, the adrenaline still was pumping through my veins. Runner’s high, meet beer-induced relaxation. If you’re interested in partaking yourself, Richmond offers plenty of opportunities. So, go ahead, work off calories, pump up adrenaline and then have a beer. Focused on the social aspect, regular running groups meet for short, noncompetitive runs and finish off with a pint or two. Those listed below welcome all levels of runners and typically include distance options. The Final Gravity Running Club has been meeting every Thursday for an evening run at 6:30 on Richmond’s North Side and averages about 40 participants each week. 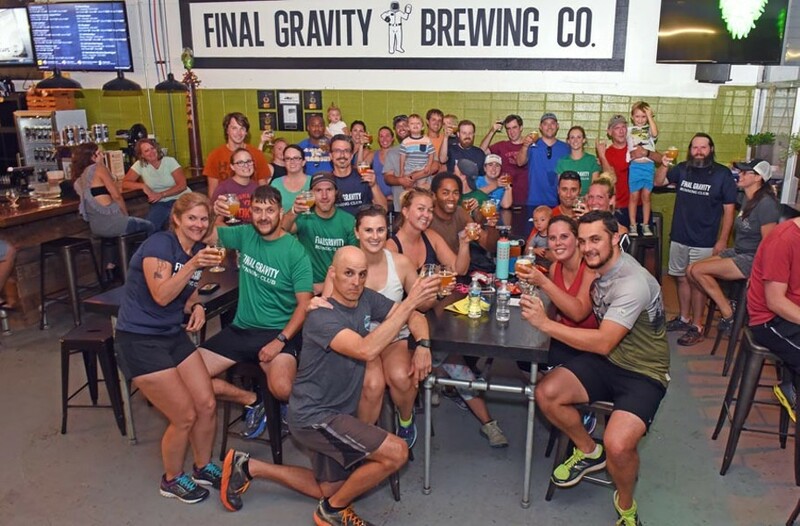 Final Gravity Brewing Co. offers a discount for the first post-run beer and a free weekly raffle. facebook.com/finalgravityrunningclub. “Part of Castleburg is being a part of the RVA Community,” says Rhonda Groves of Castleburg Brewery and Taproom, and this includes its Run the Gauntlet Running Club. The group meets on Wednesday evenings at 6 and offers 1 1/2-mile, 3-mile and 5-mile courses. The brewery gives participants happy-hour pricing and provides post-run snacks, plus a weekly drawing. facebook.com/rtgrunningclub. Interested runners can join the new Twisted Trails Running Club. Conveniently near the James River trail system and just across the river from downtown, Twisted Ales Craft Brewing is holding a meeting on Tuesday, Oct. 10, at 6:30 p.m. “We will propose a Tuesday run-walk at 6:30 p.m. and one on Saturdays at 1:30 p.m., both weekly, if we have enough weekday-weekend interest,” the brewery’s Debbi Price says. She anticipates runners of several abilities, occasional themed runs, beverage discounts, drawings and route variations. Search Facebook for Twisted Trails Running Club. The Stone Run Club kicked off on Sept. 7, featuring 1-mile and 5-kilometer routes. “The run club is weekly, currently on Thursdays at 6 p.m., but will be switching to Tuesdays at 6 starting the first week of October,” says John Wassenaar, who heads up the club. “We do offer $5 pints for runners and have done raffles for those who participate in the run as well thus far. Eventually, we would like to get a rewards program into place for runners who do come in based on mileage and are currently looking at getting that into place.” stonebrewing.com. The informal group One for the Road meets Wednesdays at various locations, typically beginning and ending at a local brew pub or restaurant: “Because we run to eat and drink!” Routes are announced on its Facebook page. Search Facebook for One for the Road. The nationally based “drinking group with a running problem,” Hash House Harriers, is the granddaddy of all running and drinking groups — or perhaps the drunk uncle. Members are irreverent, lively and rough around the edges — a fun group for many but not appropriate for the squeamish. richmondhash.com. As the popularity of craft beer has continued to grow, with more than 220 breweries now in Virginia and more than 5,000 in the United States, so has the popularity of races. Both serious and fun runs have combined the two trends, with gradations of focus on beer. On Oct. 7, Center of the Universe Brewing Co. presents the Oktoberfest-themed relay, Das Bier Run, a four-person 1-mile run followed by beer and a party. Though you may not burn too many calories running a quarter-mile, the race is timed, so you can go all out. cotubrewing.com. VA Momentum offers events throughout the region that combine fun, runs and beer — and are only as competitive as you want it to be. Beside Growler Relays in September 2016 and 2017 that included Richmond breweries, VA Momentum holds brewery-based runs in Harrisonburg, Norfolk and Northern Virginia. Upcoming relays are in Roanoke (Sept. 30), Durham, N.C. (Oct. 14) and Ashburn (Nov. 4). vamomentum.com. Local fans of adrenaline and alcohol can consider several Richmond Sports Backers events for the calendar. September brings Trails & Ales — save the date for 2018 —trail-running followed by music and a beer festival. Participants in the November Richmond Marathon and half marathon can enjoy a post-run beer, too. “A cold Sierra Nevada at the finish festival is an excellent way to cap off your race-day achievement,” says Pete Woody, Sports Backers public relations and communications manager. And Dominion Energy Riverrock races end at Brown’s Island, packed with music, sporting events, food and beer. sportsbackers.org and dominionriverrock.com.